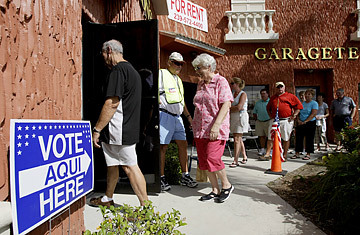 In the 2004 election, at polling sites like the Coral Reef public-library branch in the Miami suburb of Palmetto Bay, the early voter tended to be an elderly white Republican male. Four years later, the early voter enduring the long lines that snake around the Coral Reef branch is more apt to be a younger, female, African-American Democrat, like Tonia Birgin, 34, a hospital ultrasound technician. "This being Florida, you never know what's going to happen with an election," says Birgin, holding an umbrella to shield her from the midday tropical sun during a two-hour wait this week outside the library. "This one's too important not to make sure my vote gets counted right. So I'm taking my day off today to do this now, not on Election Day, when it's too late to fix things." This year Florida Republicans are probably worrying that it's too late to fix things, and much of that angst stems from early voting. Many of them, in fact, may be wondering what the GOP-controlled legislature was thinking in 2002 when it approved the practice. The answer is that it had to do something in response to the presidential-vote-recount debacle that embarrassed the state in 2000. And early voting, which allows voters to cast ballots during the two weeks prior to Election Day at a limited number of polling sites, seemed to benefit the GOP in Florida in the 2004 election (although the state kept no official count that year). But so far this year, early-voting Democrats are outnumbering Republicans at those sites by more than 20 percentage points, and a WSVNSuffolk University poll has Barack Obama leading over John McCain 60% to 40% among early voters. What's more, the number of early voters could approach 30% of all of Florida's 11.2 million registered voters by the actual Nov. 4 Election Day. That massive turnout prompted Florida's GOP governor, Charlie Crist, to flash his bipartisan bona fides this week and lengthen early voting on weekdays by four hours (while letting each county decide whether to lengthen the normal hours this weekend). Florida, the nation's largest swing state, with 27 electoral votes, is one of 36 states that allow early voting, which increases convenience for voters and reduces Election Day stress for officials. Other states, like Nevada and Georgia, are seeing similarly high turnouts. But the custom has become particularly popular in the Sunshine State, where many voters have come to view it as a hedge against Florida's notorious Election Day mishaps and misdeeds. The added factor this year is the enthusiasm among Obama voters, especially African Americans eager to elect the first black President (if not avenge what they call the Florida disenfranchisement they suffered in 2000). An unusually vast Obama ground operation in Florida has galvanized early voting, bringing movie stars like Matt Damon into Tampa for early-voter rallies and holding drum-line marches in Miami's predominantly black communities. Most polls show Obama with a narrow but unexpected lead in Florida, and the lopsided presence of Obama supporters in the early-voting lines, which affords the campaign more preElection Day publicity than normal politicking would, "is helping us torque up the vote in as many different pockets of the state as possible," says campaign spokesman Jamal Simmons. Benjamin Bishin, a political-science professor at the University of California at Riverside who has studied early voting in Florida, says this year's turnout seems to bear out research on two fronts. One is that early voting "disproportionately rewards campaigns that are better organized" because it often requires more refined voter-mobilization efforts than regular voting does; the other is that it "lowers barriers to participation," especially for hourly workers, who can least afford to take time off from work on election Tuesday. "And the fact that these voters are waiting two or three hours in line, which would seem to contradict the convenience argument, indicates they feel as if they're making some kind of statement," says Bishin. "It's as if they're waking up earliest on Christmas morning and this is their chance to influence things." Despite the two-to-three-hour waits, the Florida numbers keep growing. As of the close of polls on Tuesday, more than 1.4 million Floridians had voted early, a figure that elections officials say could double by Sunday evening. In Miami-Dade County, where Birgin voted, 162,456 people had cast ballots through Tuesday, over 40% more than during the same period in 2004. In Palm Beach County, site of the disastrous butterfly-ballot controversy of 2000, 56,685 people voted early in the first week, more than in the entire two-week period of 2004. This, despite the fact that Palm Beach County voters are dealing with their third voting-machine technology in as many presidential elections, ballot-mishandling in a recent local contest and a seldom-seen elections chief, Arthur Anderson, who has been seriously ill since losing his re-election bid in the August primary race. But a pleasant autumnal drop in temperature after a torrid summer has helped early Palm Beach voters like McCain backer Arelia Sayer, 54, forget the troubles. "We've got a beautiful day," Sayer said in line in Boynton Beach. "You've got to get 'er done." Getting early voting done can be a hassle. A big reason, besides the reduced number of polling sites, is that since there are only a handful of central voting sites, distinct ballots must be printed out onsite to match each voter's particular precinct. In Palm Beach County, for example, there are 185 different ballots. Palm Beach's de facto interim elections chief, assistant county administrator Brad Merriman, has had to enact several changes in recent weeks to ensure those votes "are all accounted for, every step of the way" between now and Nov. 4; one such change has been to make sure early votes are transported to tabulation sites overnight after polls close instead of letting them sit until the next morning. Still, early voting has evolved into a valuable test run for states after Florida's 2000 debacle, when the entire nation's electoral processes were exposed as flawed and anachronistic. This year the two-week run-up is letting election watchdogs detect potential problems  not just defective voting-booth technology but also the new no-match, no-vote laws that tighten voter-identification requirements at the polls but that critics say threaten to inordinately disenfranchise minority voters. A new concern is the home-foreclosure crisis, which in hard-hit states like Florida may leave thousands of voters without a valid voter address to claim. No major problems have been reported so far, but lawyers for both parties are at the ready (and at polling sites) to make a case if necessary. The outcome, as is so often the case in Florida, will be largely determined by the state's huge cohort of independent voters, who make up almost a fifth of the electorate. And that, say analysts, is again where early voting benefits the more potent Obama ground campaign. As more Democratic voters are checked off the list before Nov. 4, it allows his campaign to focus more of its energy and resources on the state's independents and undecideds. "You're simply able to throw that much more at the people who haven't voted yet," says Bishin. The broader small-d democratic benefit of early voting is supposed to be higher overall turnout. But analysts say the practice hasn't been around long enough to draw conclusions. The same holds for the widely held notion inside the parties  especially among Democrats, who are assumed to gain more from higher turnout than the GOP does  that early voting is an insurance policy against low voter turnout on Election Day. Nor has early voting made the case that America's Election Day should be on a weekend instead of a weekday when almost everyone is working: Bishin notes that last week, early-voting numbers in Miami-Dade County dropped from 21,000 on Friday to 14,500 on Saturday and 16,600 on Sunday before bouncing back to 24,000 on Monday. Then again, this is Florida, where weekends are for the beach  something practically everyone, Democrats and Republicans, can agree on.